This tour is designed to give everyone, even those snorkeling for the first time, a fun and secure experience. From the port, board the boat and enjoy the view as you head to Starfish Bay. Upon arrival, your guide will give you a safety briefing, short snorkel lesson and instructions on how to use the gear. Guides will assist guests into the water via a floating platform, allowing for easy access in and out of the ocean. The depths at this site vary between 4 to 6 feet of water. 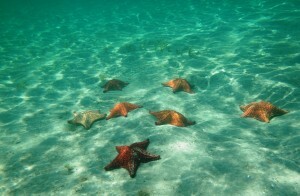 Your snorkeling experience will last approximately one hour experiencing first-hand one of Trujillo’s undersea occupants up-close, as you’ll have the opportunity to hold starfish and take photographs. Afterward, re-board the boat and head over to your beach break. Participants must be at least 4 years of age, able to enter and exit water with minimal assistance, know how to swim and be in good physical condition. It is recommended you wear your swimsuit, bring a towel, hat, sunglasses, sunscreen and insect repellent. 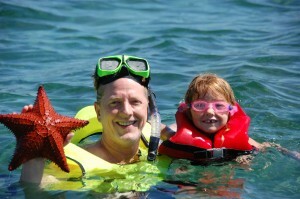 Snorkeling equipment, including snorkel vest, instruction, and supervision are provided. Guests will snorkel from an anchored platform. This tour is not recommended for pregnant women, those who have a bad back, heart conditions, and asthma or lung problems. All participants must sign a liability waiver prior to snorkeling. So, my tour….we arrived at the port by tender – smooth transition, and were met by 4 young men. They were neatly and professionally dressed, well spoken, completely conversant in English. They checked us all in and we boarded a boat to head to the starfish snorkel site. It took maybe 15 minutes to get to the area…what we found was a floating dock complete with roof and benches. The water was crystal clear and about 4′ deep. There were a couple more young men at the dock to watch over us and provide information. There were always at least 2 in the water with us and 3 on the dock watching us – I felt completely safe. And, I have never seen anything like what we saw – literally hundreds of red starfish of unreal size – probably 12-18″ across. They were everywhere moving across the sand. We lifted and looked and then put them quickly back as we found them – bottom side down. One of the crew found a sea cucumber and a non-poisonous sea urchin that they showed to all of us. There was a small wreck in the edge of our safe area – not much to see there on this particular day – some sergeant majors and coral. After about an hour of snorkeling, we boarded the boat again and headed to a private beach. Banana Coast Tours had set up 19 lounge chairs for the 19 passengers and had fresh fruit and water waiting for everyone. There was a tip jar if you chose to tip and also local beer to purchase – I think it was $2.00. We were the only ones on that beach and there were tables and umbrellas as well as really comfy hammocks. How peaceful. After some time there, we boarded a comfortable, fairly new bus, and were taken back to the port to shop and catch the tender. It was nice to go back by bus because we got to actually see some of the country. And, yes, it is poor. It is Third World. But it is also absolutely gorgeous. I would definitely go back again and I think Banana Coast Tours did a really terrific job by any country’s standards.